Tim McGraw is heading to Havana for the first time ever! This coming Memorial Day weekend, for TIM MCGRAW: ONE OF THOSE HAVANA NIGHTS, a four day trip presented by Music & Arts Live set for May 23 – 27, 2019. “I’ve never been to Cuba but have always wanted to go,” says McGraw. “I imagine the Cuban culture to be a little like growing up in Louisiana, where music, food and family play a big part in daily life. Their musical history is world-renowned, and of course, there are the classic old cars. I look forward to experiencing it all firsthand. Tim will be performing two unique acoustic shows during the trip, one exclusive to the group at the intimate Teatro Bellas Artes and another open to the Cuban public at Havana’s renowned Teatro Mella. He will be joined at the concerts by some amazing Cuban artists, including Carlos Varela, Traditionales De Los 50, and the GRAMMY® Award winning Cuban music legends Los Van Van. Click HERE for more information. Tim McGraw is working on a new album! It’s been about three years since the country star released new solo music — but in October of 2018, he shared a brand-new single, “Neon Church,” along with another new song, “Thought About You.” Both, McGraw says, are form an upcoming record. Here’s what we know so far about the next project, click HERE. 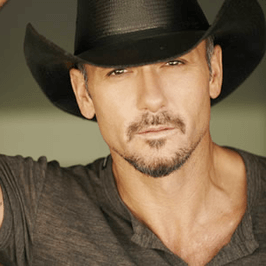 You’ll soon be able to play the slots with Tim McGraw. Mr. “Humble and Kind” rolled out his signature slot machine this week at the G2E Gaming Expo in Vegas, making quite the entrance. Tim descended from the ceiling, along with the prototype of his game, preceded by a troupe of dancing McGraws. You can relive the entire spectacle on YouTube now. You’ll have to wait until next summer, however, to get your hands on Tim’s handles, though. That’s when the new slot machine is set to arrive in casinos.